Just some of the top footwear & accessory brands they carry include: Ecco, Merrell, Dansko, Keen, Mephisto, Birkenstock, Pikolinos, Teva, Timberland, Authentic Comfort, Ugg, Beautifeel, and many more! The Walking Company is the world's largest retailer of comfort footwear, with over 80 stores nationwide. Their brick and mortar stores give customers confidence to purchase online from a reputable authority on comfort footwear. Cash Back is not available for Clearance items. 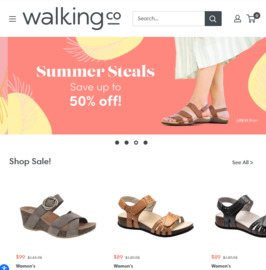 Click a Coupon or click Start Shopping to earn Up to 9% Cash Back at The Walking Company. Limit one promo code per order. While supplies last.